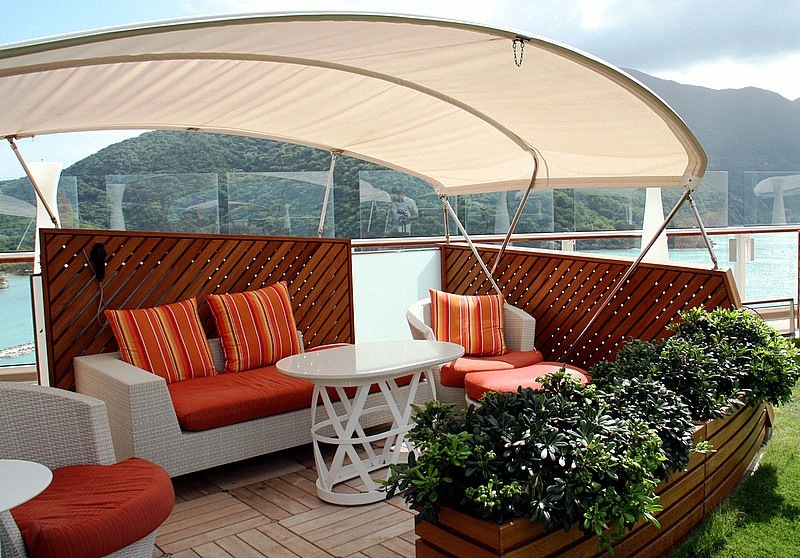 Celebrity Cruise Line continues to forge its reputation in the mass appeal luxury cruise category as a ‘notch above’ with the Silhouette. The Silhouette has the feel of modern luxury and sophistication, but she is not stuffy or pretentious. She sports contemporary color schemes and inviting tones throughout her interior – yet the overall sentiment is warm and relaxing. 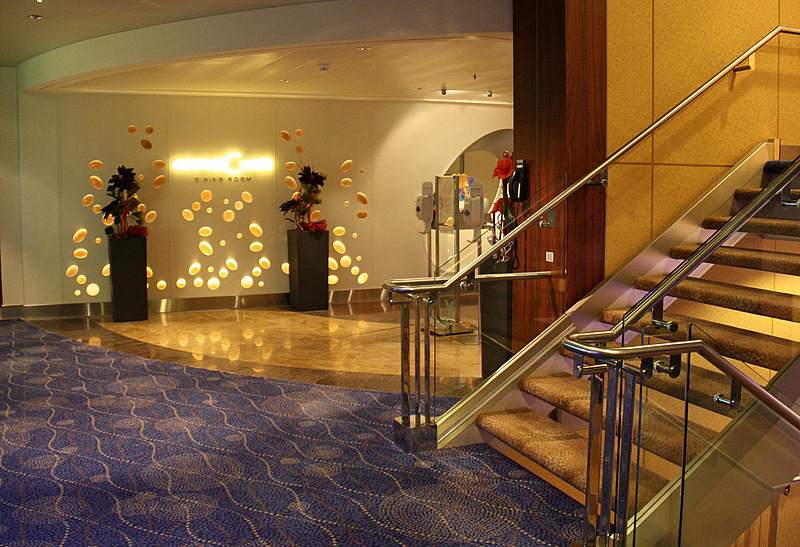 As you can see from the photo gallery, this is elegant space designed with the most discerning cruise customer in mind. There is much to discover on this ship that is not immediately obvious. There is attention to detail even in the most unlikely places. It was too hard to contain all the new and exciting features in a single article of reasonable length. There will be a Part II, so stay tuned. 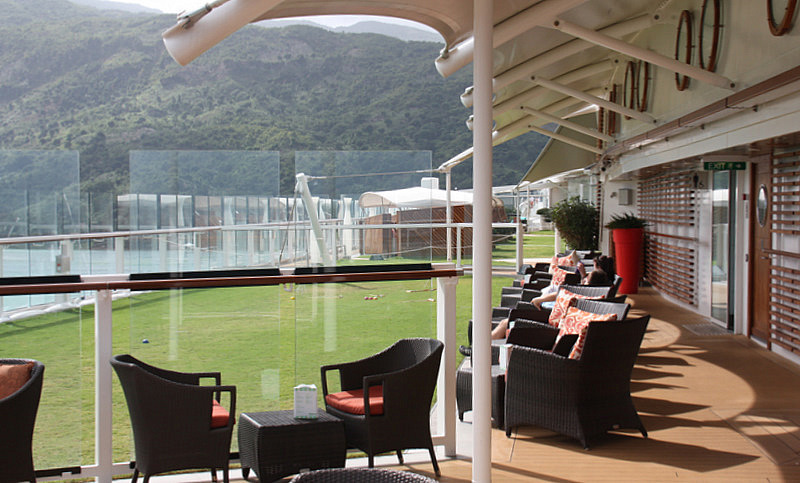 The Silhouette is the fourth of Celebrity’s Solstice Class fleet. The newest ship in this class is the Reflection which is getting rave reviews. The Silhouette is a big ship, but not the biggest. She is 122,210 tons with 15 decks above the waterline. 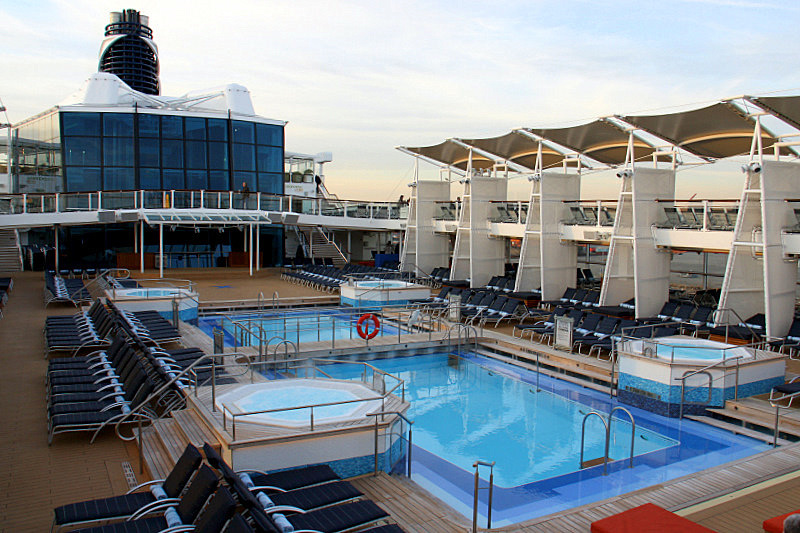 She has 1,443 staterooms with a capacity of 2,886 passengers. She sails with a crew of 1250. 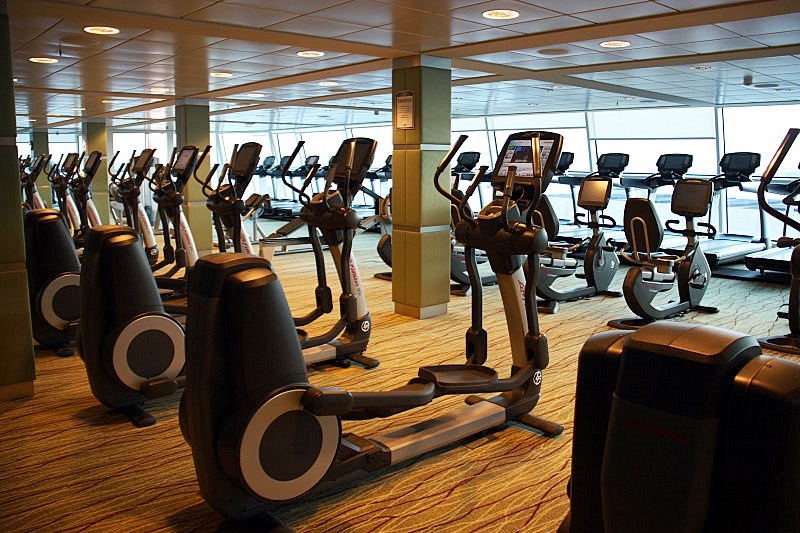 Many prospective cruisers fear crowding on these very large ships, but they are so well designed for traffic-flow that there is rarely a jam-up or uncomfortable cluster of guests. Even 2,000+ passengers tend to disappear when you spread them among seven decks of corridors with 1,443 staterooms, ten restaurants, a huge theatre, a casino, a library, art studio, photo gallery, a computer center, video arcade, fitness center, jogging track, spa, beauty salon, 14 lounges and bars, multiple swimming pools, sundry whirlpools, several sun decks, a dozen or so “quiet hideaways,” a vast real-grass lawn club, and a huge gallery of fine boutique shops. Whew! They should issue walkie-talkies to stay in touch with friends. Even during port visits, the disembarkations are orderly and the process moves along quickly. 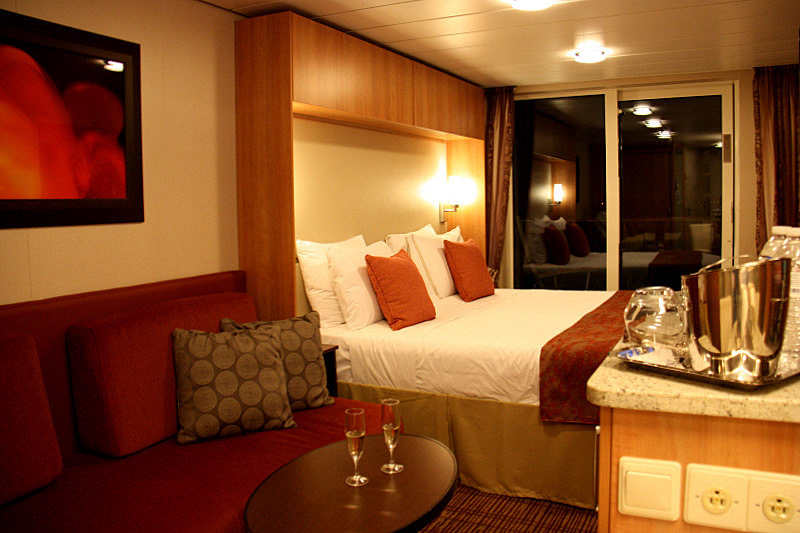 The stateroom designs on the Silhouette are sleek, open, and comfortable. 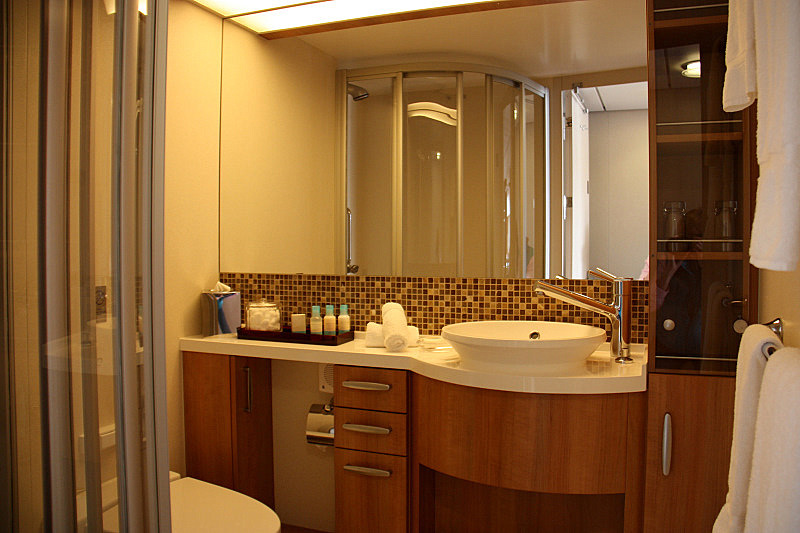 Each standard stateroom has sizable modular closets and useful under-bed storage. The beds are luxurious with rounded bed corners. The bathrooms are roomy with sliding doors on a bigger than expected shower. There is a convenient footrest in the shower – sometimes it is the smallest things that make us smile. Each stateroom has digital entertainment. That means a reasonable selection of free movies, and crystal-clear reception on a flat screen TV. 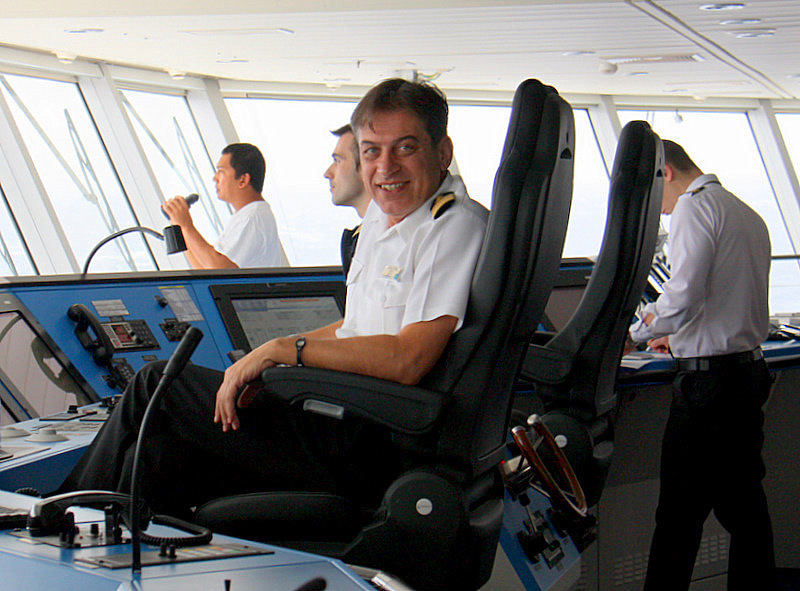 Network TV channels are conveniently available at sea. 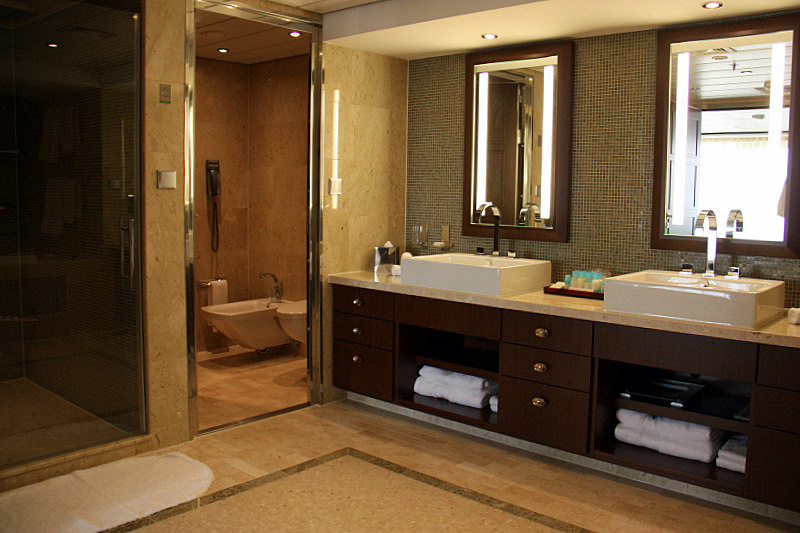 The staterooms are quiet – no rattles, squeaks, or passageway noise. The pictured penthouse suite in the slideshow photo gallery is 1,291 square feet of floating luxury. 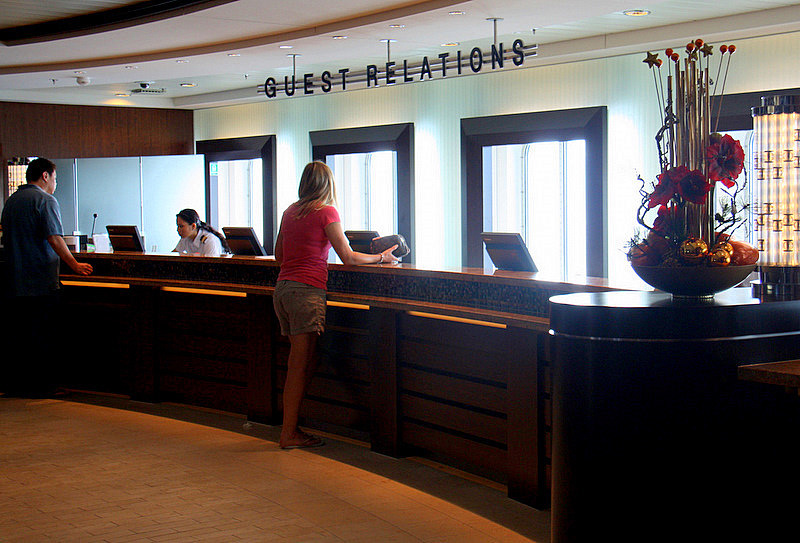 All the suites aboard the Silhouette elegantly avoid being trendy and thematic. 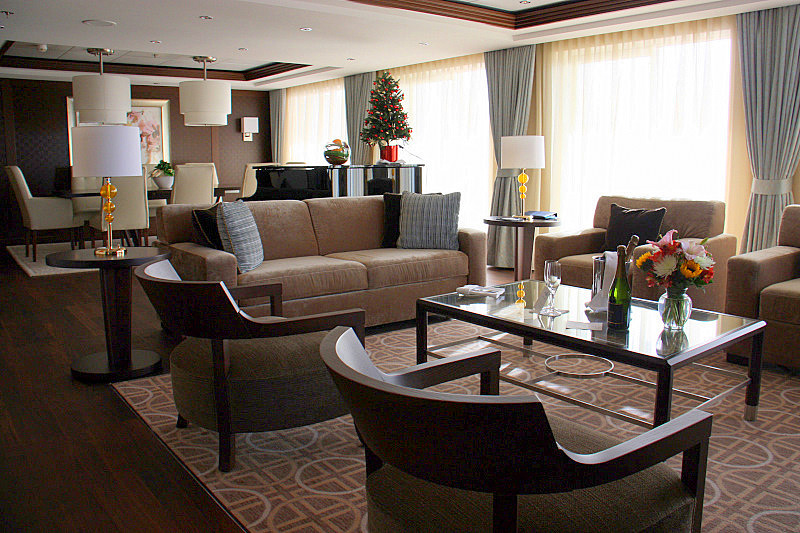 Each suite is lavishly decorated to be a fitting home for any duration. We wanted to stay after we took the photographs, but the lucky vacationing key-holders had arrived. 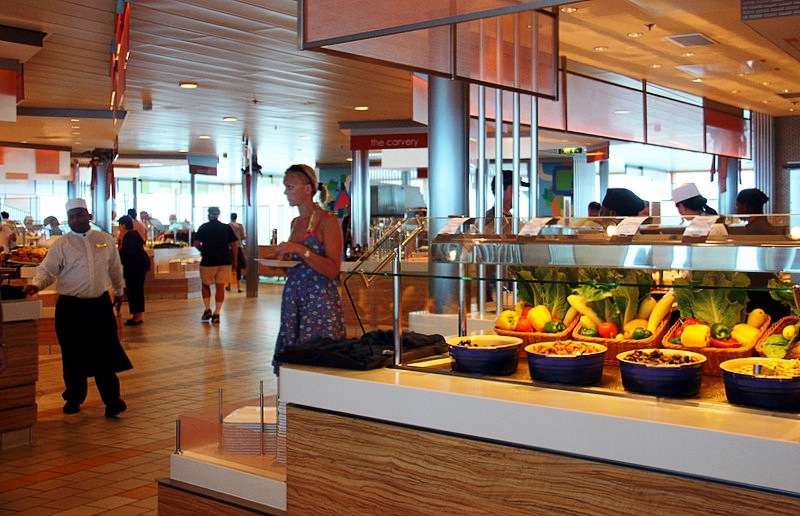 Food plays a role of cardinal importance on any cruise vacation and Celebrity prides itself in culinary leadership and innovation. With ten restaurants, and multiple dining-time choices, only those who favor open dining without a reservation face any delay in seating in the main dining room. 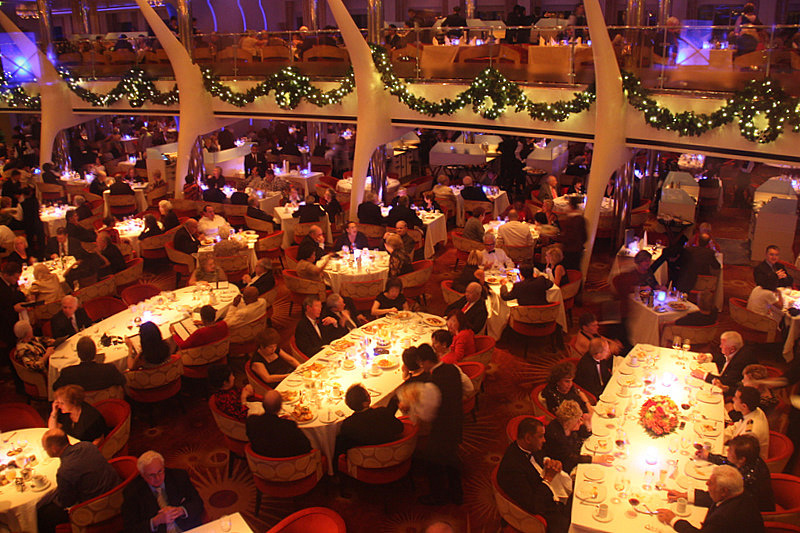 On Celebrity, passengers can enjoy the traditional early or late seating at the same table and with the same companions at every dinner. Conversely, they can reserve a different time for dinner every night – In which case they can dine alone or with others – a chance to make new friends. In either situation, seating comes quickly in the main Grand Cuvee’ restaurant. For breakfast and lunch there is open seating in the main dining restaurant for the published hours that the room is open. 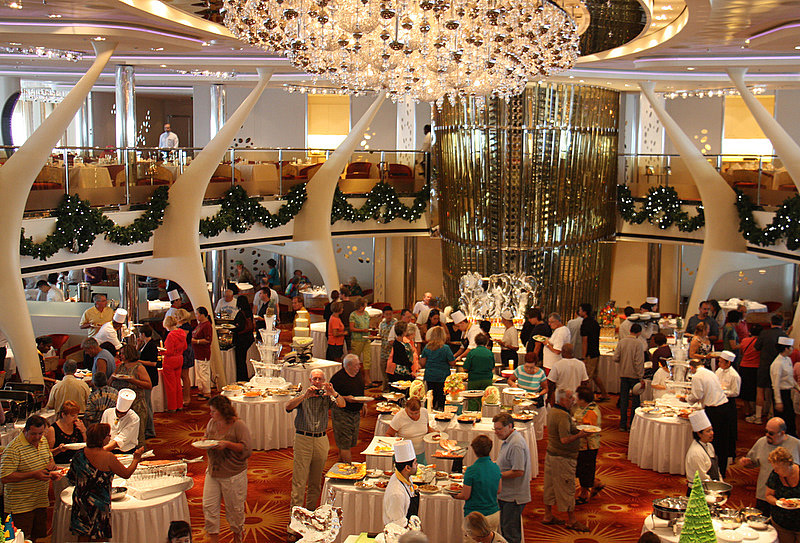 The Silhouette has one of the finest casual buffet dining rooms at sea. 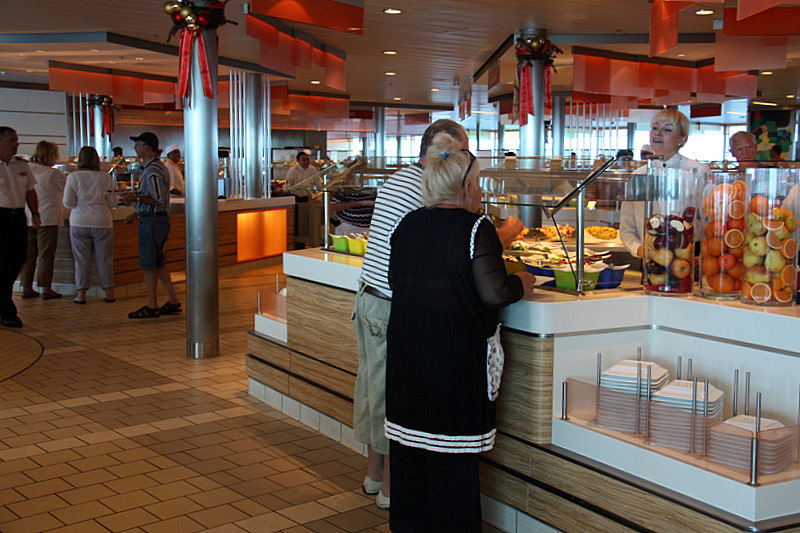 The Oceanview Café on Deck 14 has both indoor and outdoor seating. 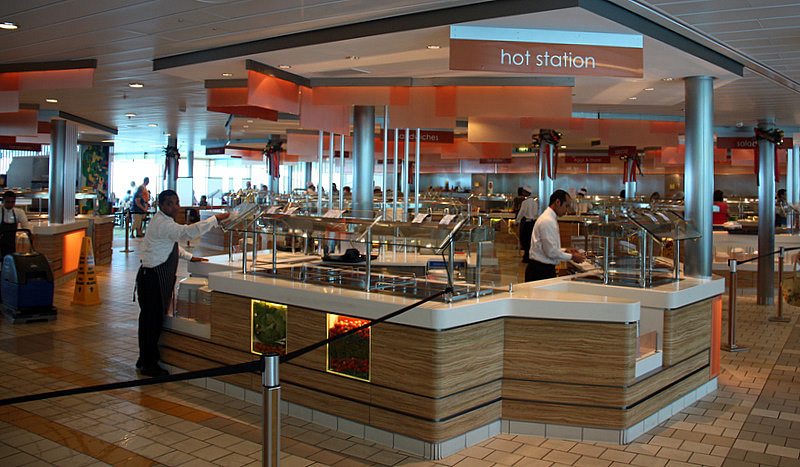 It serves breakfast, lunch, and dinner from a series of small food islands in the center of a circle of ocean view tables. Each island features a cornucopia of different tasty selections at every meal, and the culinary offerings are reassuringly diverse. Care for Indian, Asian, Italian, Vegan – it’s all there to enjoy. 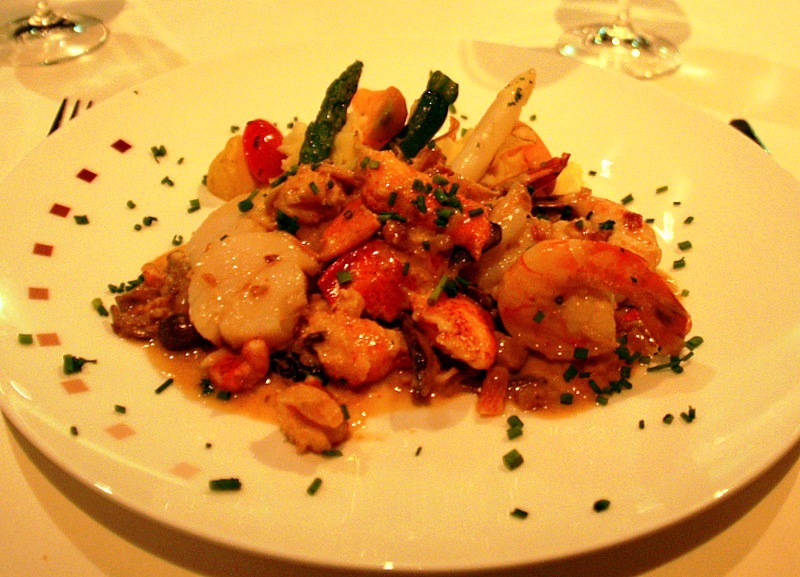 It would be a rare guest indeed that could not find an interesting and delicious meal at the Oceanview Café. 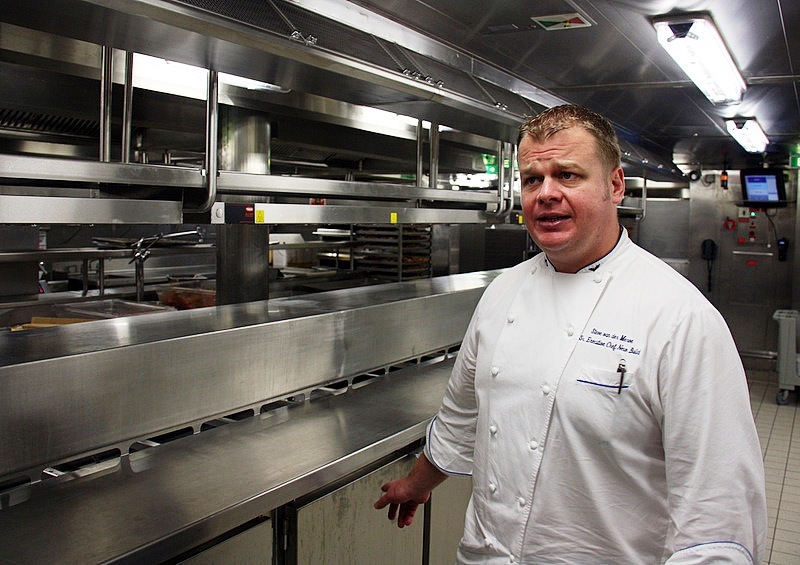 A very important personage on any cruise ship is the Executive Chef. In the case of the Silhouette, and on our cruise, his name is Steve Van der Merwe from South Africa. Chef Steve is a true master of balance and expediency as he orchestrates 13,000 meals per day among several dining venues. His staff also prepares between 100 and 700 room service trays per day. 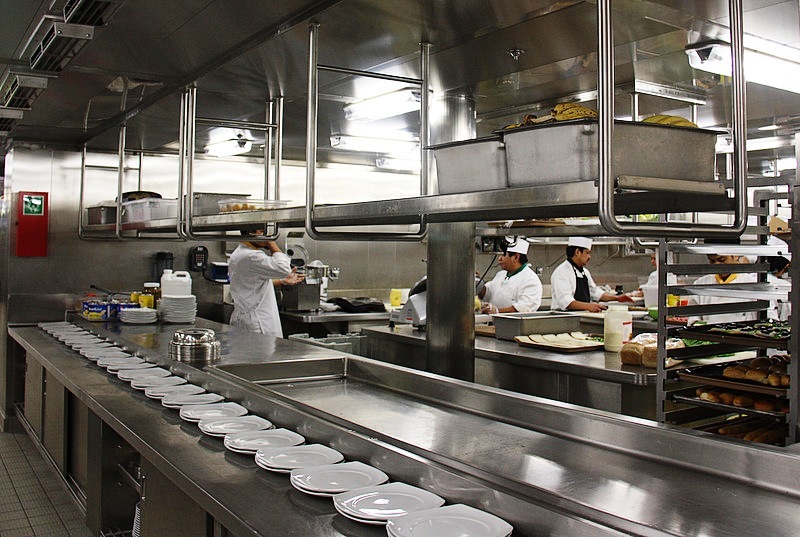 An example of the complexity and enormity of a cruise ship kitchen: A favorite dinner on any cruise is one that offers broiled lobster. 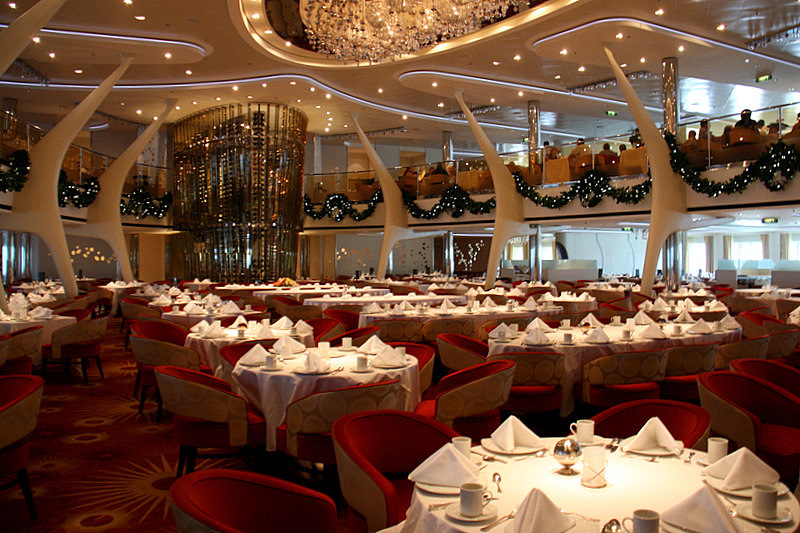 Typically, passengers on a ship the size of the Silhouette will consume about one ton of lobsters at that single meal. Serving thousands of lobsters at just the right temperature, texture, and consistency is just short of a culinary miracle. Somehow, they get the steaks just right as well. Kudos to Chef Steve and the other great Chefs of the Seas. If you want more intimacy while dining, or wish to celebrate a special occasion, for an additional charge the Silhouette offers the answer. The specialty dining rooms offer food to inspire even the most discerning palates in a most enchanting dinner setting. 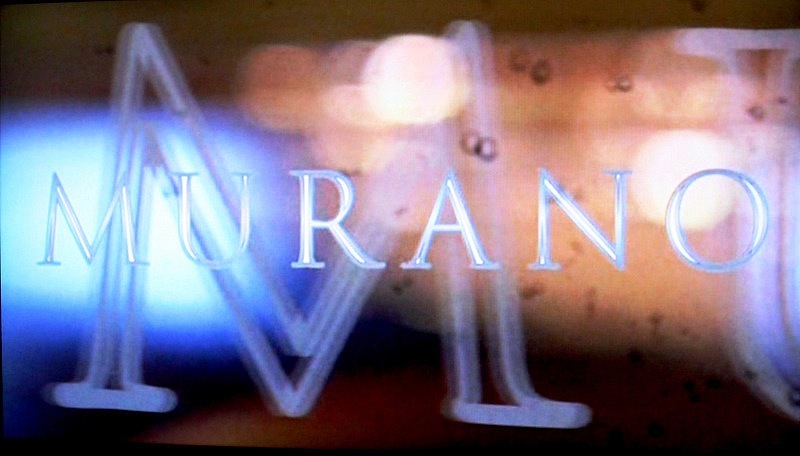 We sampled the cuisine at the “Murano,” one of the five specialty restaurants on board the Silhouette. Each of these restaurants has its own kitchen, and each table is replete with exquisite china and gorgeous crystal. Mr.Tudor Soacat, Maitre D’ Hotel of the Murano spares no effort to make certain his guest’s continental dinner is delicious and memorable. 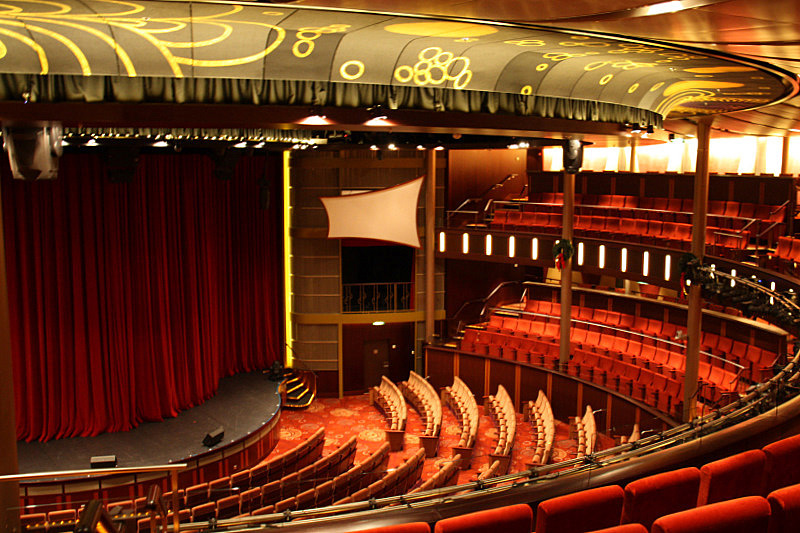 The 1113 seat Silhouette Theatre is the first Theatre on a cruise ship designed to accommodate aerial acrobatics – this is an exciting addition to the traditional Broadway style reviews usually found at sea. 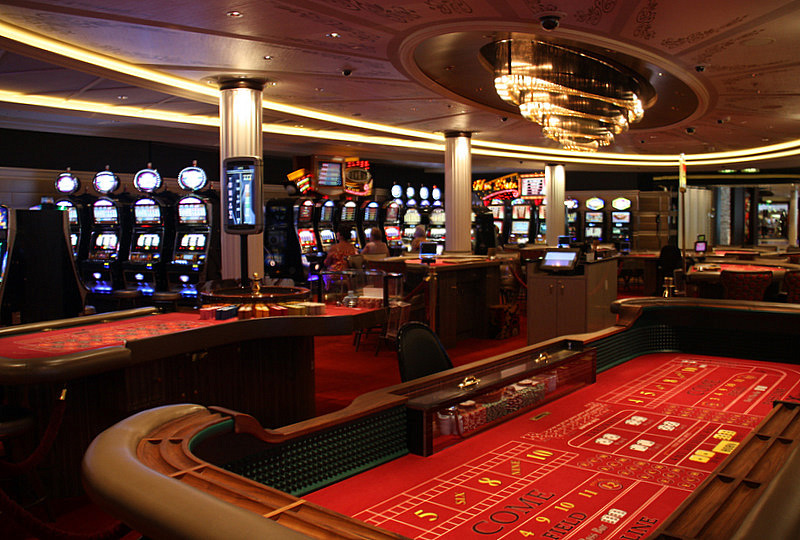 Like other progressive lines, Celebrity Cruises does not require their professional entertainers to do double duty as Bingo hosts or passenger group moderators. Consequently, they can attract a better class of performer. The quality of the “star attractions” on the Silhouette was quite good. However, we were disappointed in the choreography, costumes, and the set designs of the revues on this Celebrity cruise. In our view, this was the only aspect of the entire cruise that failed to meet the high Celebrity standard. 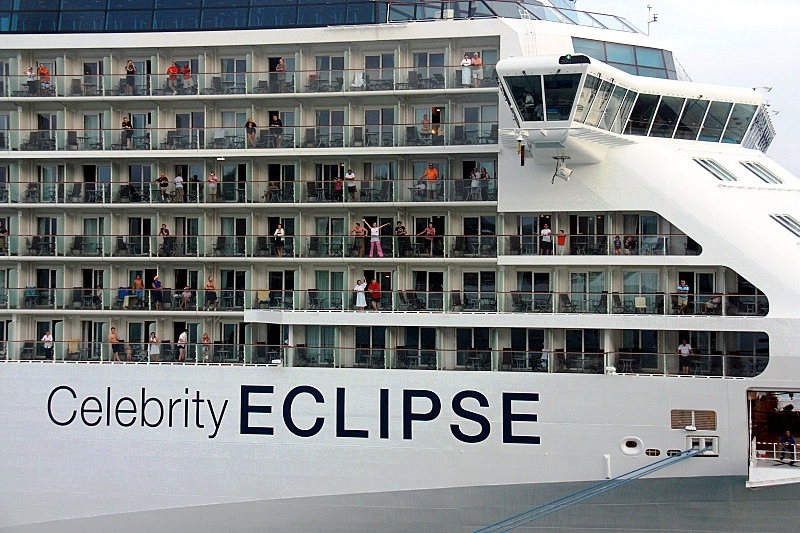 Notwithstanding our disappointment with the production shows, we heartily recommend Celebrity Cruises and the Silhouette for a vacation at sea. In our fast-paced modern world, the chance to get away from it all can do wonders to recharge our batteries and re-energize our lives. 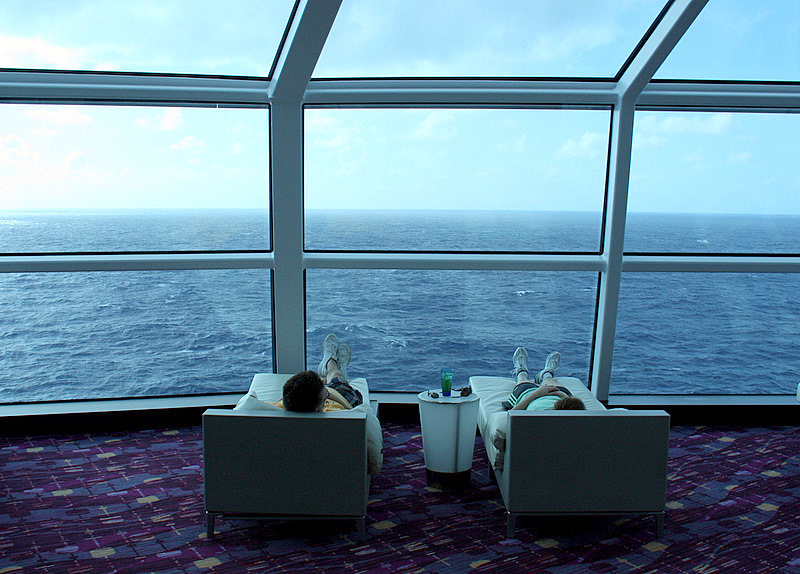 There is nothing like a top-notch cruise to do the trick. Be sure to see our complete photo gallery of the beautiful Silhouette by clicking *here*. 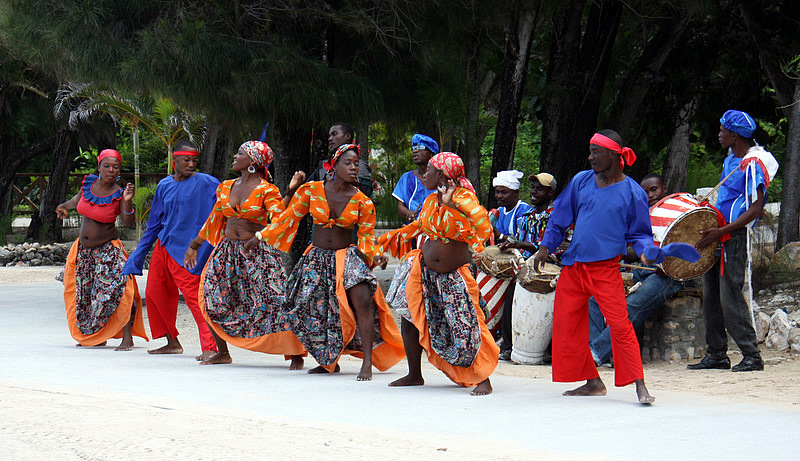 The Silhouette will be sailing an Eastern Caribbean itinerary out of Ft. Lauderdale, Florida from December 2013 through April 2014. On this trip, we also discovered a great private-car service in GroundLink.com. They offer private car service throughout the United States (and many foreign countries) and all airports and cruise ports. More on them in the next article as well. You can check them out now at http://groundlink.com, or call toll free in the US: 1-877-227-7260. This entry was posted in Celebrity and tagged Best Crews, Best Cruise Lines, Celebrity Cruise Line, Cruise Entertainment, Silhouette. Bookmark the permalink. Being a cruise lover and frequent voyager, I am extremely particular about the kind of food and entertainment available on board. I must say, you guys are doing a remarkable job. Looking forward at experience. Thanks for sharing.